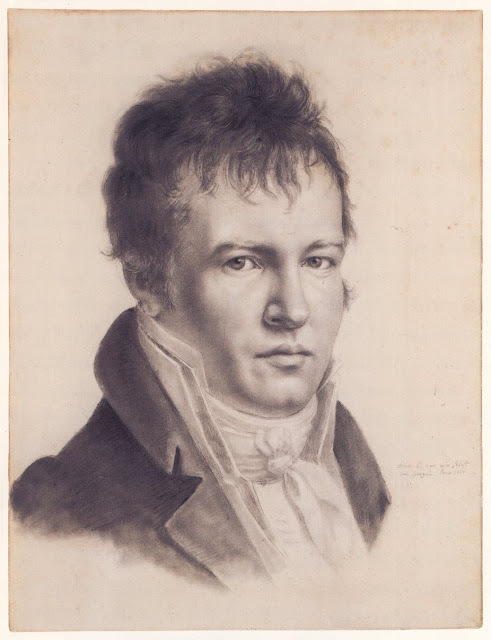 Gaze at Alexander Von Humboldt’s 1814 self-portrait and you peer into the eyes of a man who sought to see and understand everything. 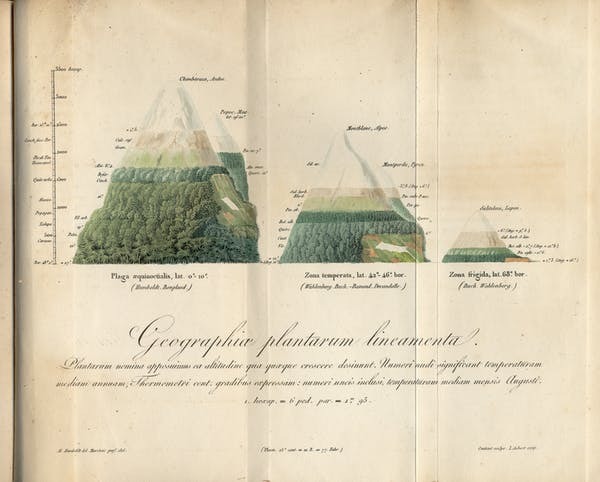 By this point in his life, at age 45, Humboldt had tutored himself in every branch of science, spent more than five years on a 6,000 mile scientific trek through South America, pioneered new methods for the graphical display of information, set a world mountain climbing record that stood for 30 years and established himself as one of the world’s most famous scientists, having helped to define many of today’s natural sciences. Humboldt, born in Berlin, is sometimes called the last Renaissance man – he embodied all that was known about the world in his day. He spent the last three decades of his life writing Kosmos, an attempt to provide a scientific account of all aspects of nature. Though unfinished at the time of his death in 1859, the four completed volumes are one of the most ambitious works of science ever published, conveying an extraordinary breadth of understanding. Throughout his life, Humboldt sought out the world’s interconnections. Today knowledge can seem hopelessly fragmented. The sciences and humanities speak different languages, the scientific disciplines frequently seem incommensurable and the university itself often feels more like a multiversity. Against this backdrop, Humboldt represents the aspiration for encompassing order; if only we look deeply enough, we can locate an intricate underlying harmony. The principal impulse by which I was directed was the earnest endeavor to comprehend the phenomena of physical objects in their general connection, and to represent nature as one great whole, moved and animated by internal forces. Humboldt’s belief in the unity of the cosmos had far-reaching implications for understanding humanity, too. He rejected what he saw as obsolete and pernicious divisions of the world into Old and New. 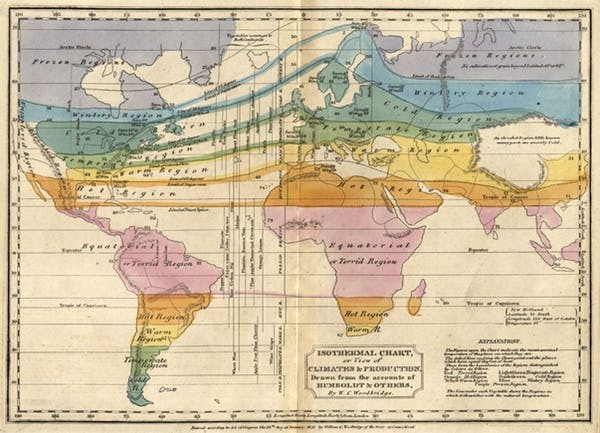 Through his geological, meteorological and botanical maps he showed that distant parts of the globe can be more like one another than their immediate neighbors. Not surprisingly, when Humboldt surveyed humanity, he was more impressed by the commonalities than the differences. In fact, he was an ardent champion of the freedom of all peoples. When Humboldt obtained Spanish authorization for his explorations, he did it for reasons very different from those of the Europeans who had first visited the same uncharted lands. Unlike them, he was not primarily interested in exploiting the land and its native peoples for his own personal gain. He saw South America not as booty to be hauled back to Europe, but as a doorway to discovery waiting to be opened. Through it, he would reveal previously unseen relationships between far-flung places and the species that inhabit them. Another Humboldtian legacy is the appetite for exploration and adventure. In Humboldt’s view, the student of the world needs to get out into it, directly encountering its manifold vistas. In effect, Humboldt encouraged scientists to make the world itself a laboratory, employing every sense and instrument at science’s disposal to observe, measure and catalog it. Humboldt communicated this sense of adventure in his writing. Scientists nowadays write in the passive voice, as though disinterested or even disembodied figures do the work of science. Humboldt reminds us, however, that the researcher is one of science’s most crucial ingredients. Curiosity is both the spark that makes inquiry possible and the source of the excitement that sustains it. Moreover, omitting the investigator can open the door to forms of irresponsibility and inhumanity that Humboldt deplored. Of Humboldt’s influence in America, Emerson wrote, “He is one of those wonders of the world who appear from time to time, as if to show us the possibilities of the human mind.” Humboldt even powerfully influenced the poetry of Walt Whitman, who kept a copy of Kosmos on his desk for inspiration as he wrote Leaves of Grass. Such examples testify to the power of Humboldt’s spirit, which to this day inspires generations of investigators to venture out into the world to uncover its underlying connections.